Earlier this week when I made the lamb and mint meatballs with farro risotto and cilantro pesto I made a double batch of the cilantro pesto because I wanted to make sure that I had some estra. Leftover pesto is always good and I like to use it in pastas, whole grain salads, soups and this time I had my heart set on using it in a sandwich. I still had some roasted red peppers in the freezer and I was thinking that a chicken sandwich with roasted red peppers and cilantro pesto would be good. I often like to add cheese to my sandwiches and I was thinking that goat cheese would go well in this one but I already had some feta on hand and I figured that would be just as good. I also like to try to at least try make my sandwiches look a bit healthy so I often add some green in the form of lettuce or in this case some baby spinach. I thought that the sandwich was all done and then while I was thinking about the mediterranean flavours going on, inspiration struck and I knew that I would just have to add a touch of hot smoked paprika! The sandwich was easy to make and it turned out great! The sweet roasted red pepper went well with the salty feta and the cilantro pesto added a really nice touch of the exotic that rounded out the flavours nicely. Just look at how the feta was starting to melt and ooze out spreading its goodness throughout the sandwich! Adding the smoked paprika was the right call as it really made this sandwich with the hint of smokiness and the touch of heat! Dust the chicken with the paprika and season it with salt and pepper. Add the chicken and cook until it is golden brown on both sides and cooked all the way through, about 4-7 minutes per side. Assemble sandwich, brush both sides with olive oil and grill until golden brown on both sides. My first thought was, that is one hell of a gob (jaw) busting sandwich, then I realized that the 2 halves are stacked. Duh! Looks and sounds delish, Kevin. Another one of your wonderful dishes Kevin….it looks fabulous!!!! Have a great weekend. That sandwich is terrific! Very flavorful! 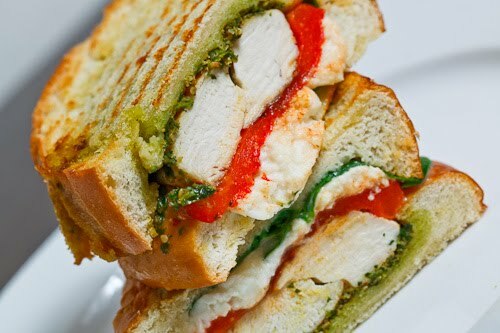 This sandwich looks incredible! I love all of those flavors! The colors really grab me on this one — what a gorgeous sandwich! *sigh* you know I am against posting just because it looks good,(but a little tall) but, it does. Better yet, sounds good. I assume the white on the bottom is the feta? And a question, I thought you pounded the chick. looks round? Maybe just me. But because I really like most of your stuff I am here WITHOUT trying it, (which is totally against my cooking religion) 🙂 c.
Another of your wonderful and delicious sandwiches. This looks like a killer sandwich. Panera needs to take a hint from YOU! Excellent! I had thought of making paninis this week and this looks great. saw this on tastespotting and swooned. it's a lovely photo and has wonderful flavours in one bite, i can imagine. That looks like a great sammie, Kevin! Yum! I love sandwiches such as this! Wow… this really makes me want a panini press (or at least a grill)!! That is a good-looking sandwich! I love the additions of feta and roasted red peppers on paninis. Love the tang, the color and the variety – yes will do this – with whatever pesto I have on hand. Rebecca: I use a grill pan and push down on the sandwich with a bowl when I make paninis. We need a panini press! It would be fun to get that great grilled look on sandwiches. hey what kind of bread did you use to make the sandwich, and is that all the things you used to flavor the chicken breast? I'd like to know because i want to make it. could you maybe send me some detail on how to make it? Sachii: I used an Italian loaf for the bread but something like a ciabatta would also be nice. The chicken is seasoned with paprika, salt and pepper.